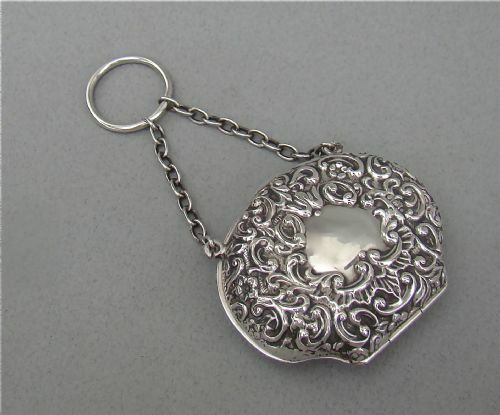 This is an exquisite pebble-shaped silver purse. The oval body inlaid with connemara marble shamrocks surrounded by foliate decorations. Opens to reveal a light tan leather interior divided in three compartments. The back left plain bears the hallmarks. The sides with silver chain. MBROS for the Mousley Brothers. 7cm x 5.5cm: 3 inches x 2 inches. Weight: 56g / 1.9 oz. Front in perfect condition with no loss to the marble and no dings. Hallmarks slightly rubbed but legible. Leather interior in very good condition. 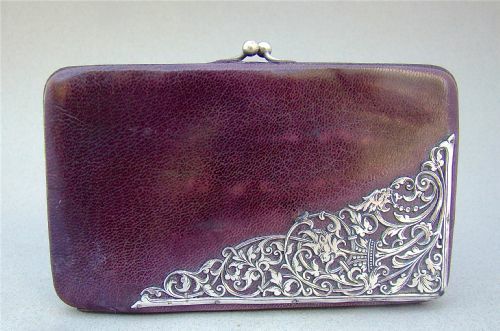 This is a very pretty silver purse made in Birmingham 1906 by the reputed Henry Matthews. Of unusual shell form, both sides embossed with foliate scrolls. The fully functioning front clasp opening to reveal the original moire green silk interior. Fitted with its original chain and ring handle. H M for Henry Matthews. 5cm x 6cm: 3.2 inches x 2.3 inches. one minor ding to the front , barely noticeable. Original interior in good condition with no tears. 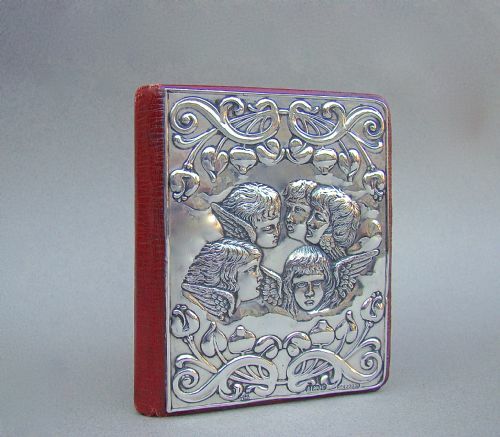 This is a fabulous Edwardian silver and red Morocco leather address book. The silver mounted front embossed with the very sought-after Reynold's angels pattern. It has a registration number so was a patented design. The back and spine a rich red leather, the pages gilt. The interior is clean and has not been used. WJM& Co for W J Myatt & Co. Height: 12cm / 4.4 inches. Interior with original silk compartments. A fabulous and unsual item in excellent unused condition. Leather in very good condition. Silver corner in very good condition. SOLDhe sloping front embossed with the very sought-after "Reynold's angels " pattern. 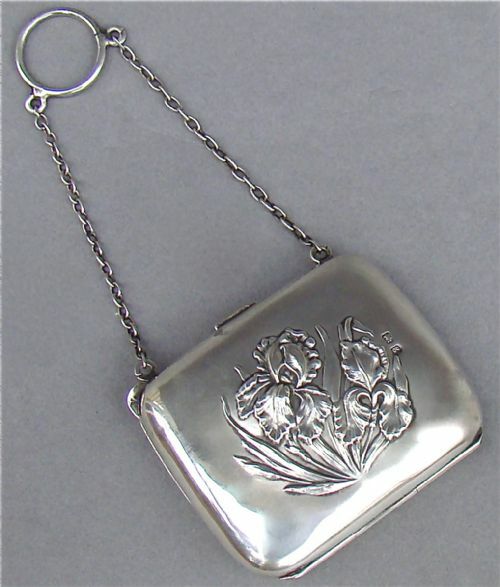 This is a very pretty silver purse made in Birmingham in 1906 by William Hayes. The front charmingly engraved with foliate decorations surrounding a vacant reserve. The back with conforming decorations.The fully functioning push button clasp opening to reveal the original red moire silk interior. The interior divided in five compartments, the central section with a hallmarked silver clasp. 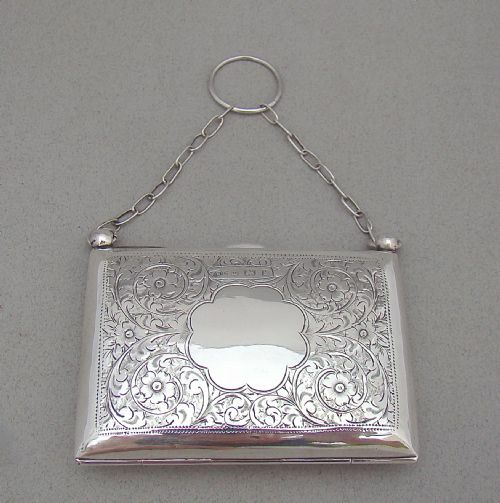 This is a very pretty silver purse made in Birmingham 1906 by the renowned Henry Matthews. The front charmingly embossed with irises, a very popular pattern. The fully functioning front clasp opening to reveal the original moire green silk interior. 6.5cm x 5cm: 2.4 inches x 2.2 inches. Weight: 40g / 1.4 oz. 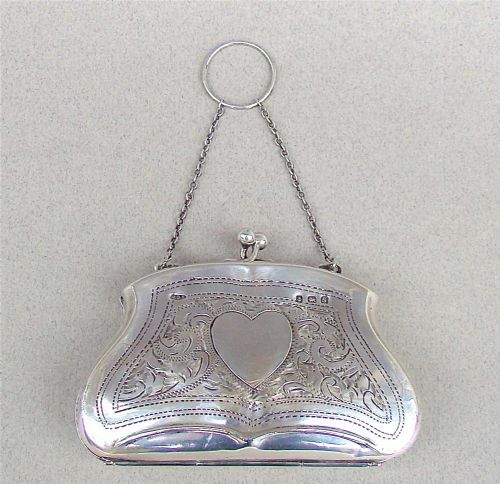 This exquisite solid silver purse was made in Birmingham 1910. Of rounded rectangular form, both sides with a spot-hammered finish. The clasp opens to reveal a dark green moire silk interior divided in three compartments. 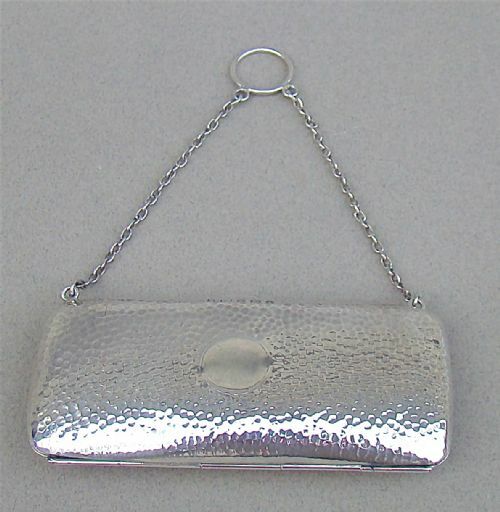 The sides fitted with a chain and suspension ring to allow a lady to hold her purse while holding her cocktail glass. S&Co for Sydney & Co. 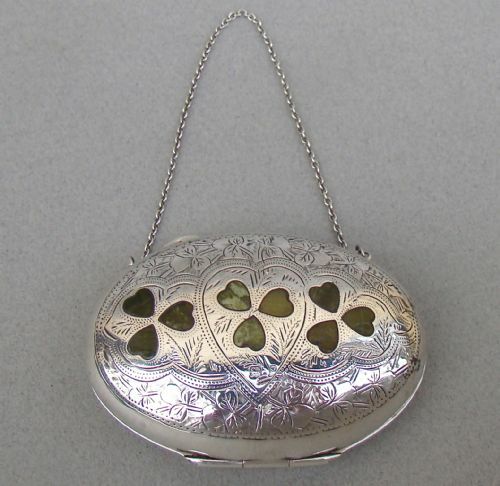 This exquisite solid silver purse was made in Chester 1917. Of conventional form, both sides embossed with flower garlands surrounding a blank oval reserve. The clasp opens to reveal a light tan leather interior divided in three compartments. Date letter "R" for 1917. 10cm x 7cm: 4 inches x 2.6 inches. 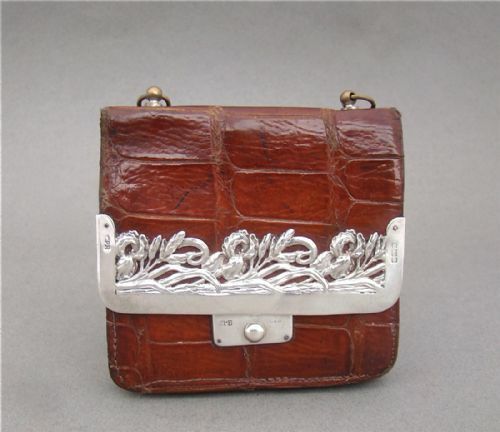 This tactile silver mounted small crocodile purse is dated Birmingham 1901. The purse, a rich glossy colour, opens to reveal a light tan leather interior with two compartments for notes, documents and stamps and a central purse for coins. The hallmarked silver border exquisitely applied with irises, a very popular motif in the Art Nouveau period. The top fitted with two brass rings to allow for a strap. CPB for Charle Penny Brown. Crocodile skin in superb glossy condition. Silver corners in excellent condition. a couple of scuff marks on front sleeve. A couple of pen marks on the interior. 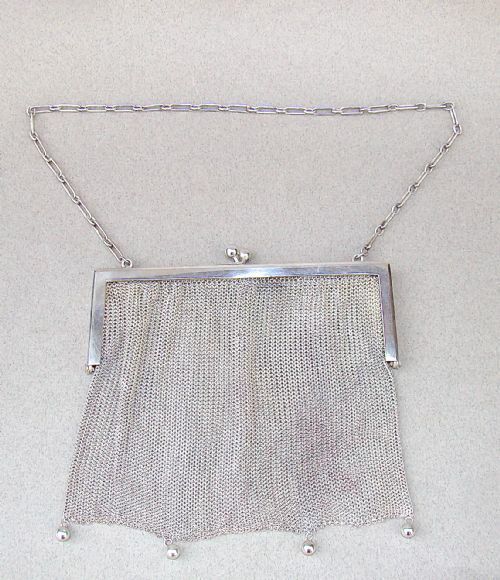 This is an exquisite continental silver chain-mail cocktail bag bearing imports marks. The solid silver clasp set fitted with silver chain. Both sides of the clasp separately hallmarked. Length (excluding the chain) : 10cm / 4 inches. This is a fabulous late 19th Century French marroon leather wallet with an exquisite and intricate pierced and engraved silver mount, depicting lions and mythical creatures within a cornucopia and foliate scrolls. The wallet opens to reveal a leather and purple moire silk nterior with two compartments for notes, documents and stamps. French maker's marks in lozenge. 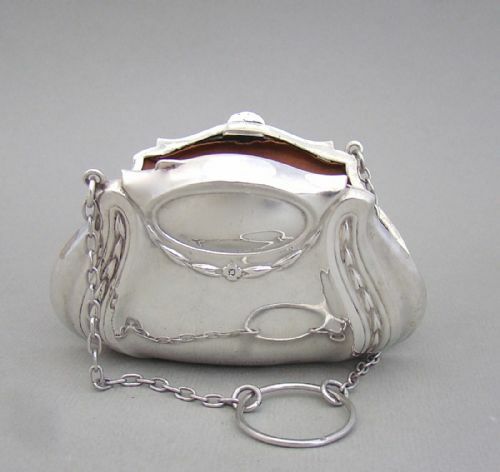 This exquisite solid silver purse was made in Birmingham 1917. Of conventional form, the front engraved with foliate scrolls surrounding a heart-shaped reserve. The back with conforming foliate scrolls. The clasp opens to reveal a light tan leather interior divided in three compartments. F.D.L for F D long. 9cm x 6.5cm - 3 3/8 inches x 2 4/8 inches. 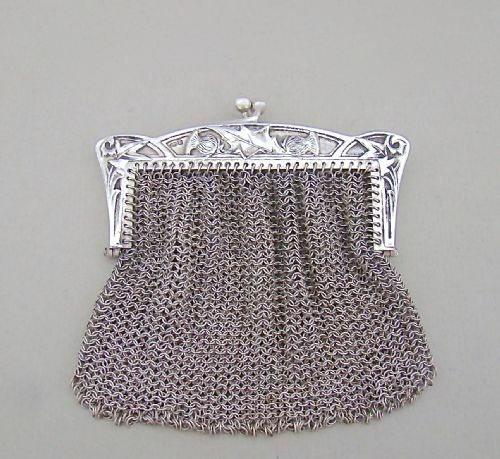 This unusual small continental silver chain mail purse, also described as misers purse or dance bears imports marks for Chester 1911. The solid silver clasp prettily engraved with thistles opens to reveal a single compartment. Date letter "l" for 1911. Length: 7.5cm / 2.6 inches. Width: 7.5cm / 2.6 inches.